These 75ohm RG6 cables have F-Male connectors on BOTH sides. These cables are ONLY appropriate for use with 75ohm equipment. 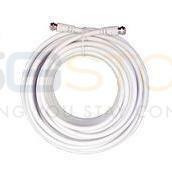 These cables WILL NOT WORK with 50ohm antennas and amplifiers - instead use the Ultra Low Loss cables.